This year’s House Warming Party will be held at Celine and Company on Broadway, on Thursday, November 20th, so save the date! 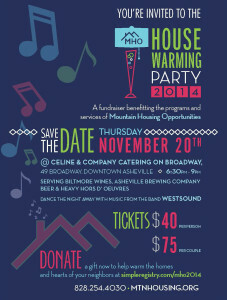 MHO’s House Warming Party is our biggest fundraiser of the year. It’s our chance for our friends and neighbors to gather together to have fun and enjoy music and good food, but also to raise money for the people who most need the programs and services of Mountain Housing Opportunities. 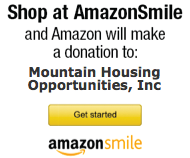 For the past two years, MHO has used a unique online Gift Registry that allowed people to purchase items like 2 x 4’s and nails, and shingles, and even things like credit reports for people wanting to rent MHO apartments. Thanks to our generous sponsors and donors, the Registry and the event last year raised more than $45,000! To give a gift through this year’s registry, go to www.simpleregistry.com/mho2014.